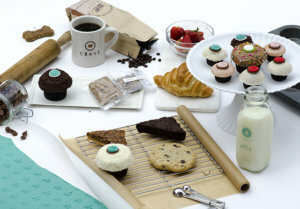 Voted consecutively as Houston’s Best Cupcakes we at CRAVE take baking seriously! We start each morning with our house made pure vanilla bean extract, luscious dark and sweet chocolates, seasonal fruits, and European butter. We handcraft our cupcakes and bakeshop items in small batches throughout the day to ensure they are always at their freshest. Let us be a part of your life’s most special occasions, your clients’ favorite gifts, and sweetest memories. With a menu that rotates daily as well as seasonally, we’re always able to offer more CRAVE to love.